Every tooth is valuable to your oral health. When even one is missing, it can be a struggle to chew certain foods. This may cause you to limit your diet, which can lead to nutritional deficiencies. You may also have difficulty speaking clearly. Although these complications have caused your quality of life to decline, there is a larger issue brewing beneath the surface. When you lose a tooth, the crown is not the only thing missing. You also no longer have the root. As a result, the jawbone is not stimulated, so it starts to deteriorate. You can lose as much as 25% of its width within the first year of leaving a missing tooth untreated. As time passes, your jawbone’s height will decrease by as much as 4 mm. The more bone you lose, the more your gum tissue decreases as well. Over time, the compromised bone density causes your remaining natural teeth to lose support. They will drift toward to open space, creating bite and alignment issues. This also makes your teeth harder to clean, increasing the risk of tooth decay and gum disease. Without the right support, your remaining teeth will eventually become loose and fall out. There are many treatments to fill the space of missing teeth, but there is only one that stops bone loss. 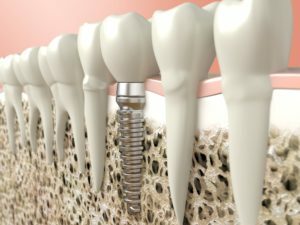 Dental implants are the only prosthetic to replace both the root and crown of a tooth. Surgically placing an implant post into your jaw acts as a new root to stimulate bone growth. This preserves your jawbone’s density to stop the complications of missing teeth. You will invest in your oral health while restoring your quality of life with the next best thing to your natural teeth. With your jawbone fused to the post, you can rest assured your new smile will last because dental implants have over a 95% success rate. To not let the complications of missing teeth hurt your oral health any longer. Enjoy a long-term solution to complete your smile with dental implants. Allheart Dental Implants & Orthodontics embraces the latest advancements in dentistry to promote our patients’ oral health. We offer the solutions you need to cater to your individual needs, like treating tooth loss. If you are ready to replace your missing teeth, contact our office today to see if dental implants are right for you.